We all know how, just before Halloween, the stores are filled with displays of orange pumpkins of all sizes. They get taken home with the rest of the groceries, carved and decorated by mom and the kids and are set on the front porch to vie for attention with all their cousins along the street. The carefully scraped out pulp is discarded and a few days down the line the pumpkin follows it into the trashcan. Pumpkin is an incredibly versatile fruit, a member of the squash family and, as any vegetarian can tell you, can be used for a multitude of delicious dishes, as well as being chock full of goodness. While Halloween may be over for another year, there will still be pumpkins in the stores, so why not give some of these wonderful fruits a good home. Can You Carve and Consume? You certainly can use your Halloween pumpkin to carve out some great snacks and meals. About the only part you can't eat are the stem and the tough outer skin of the fruit. 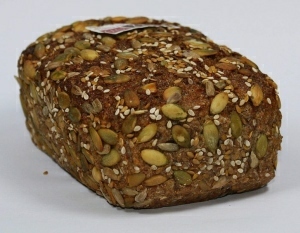 The seeds, also known as pepitas, are a real crunchy, tasty treat, roasted with a little oil and some seasoning. Clean them off as best you can and leave them to dry overnight, before placing them in a single layer on a cookie sheet and bake for 15-20 minutes (no longer) at a temperature of 160-170F. Bursting with goodness, pepitas provide us with: zinc; Vitamin E (in the form of: alpha-tocopherol; gamma-tocopherol; delta-tocopherol; alpha-tocomonoenol; and gamma-tocomonoenol); manganese; magnesium; phosphorus; copper; protein; iron; phosphorus; and tryptophan. Pumpkin seeds are also brimming with antioxidants, which help to combat the effects of free radicals. The flesh of the pumpkin can be used to make all kinds of attractive sweets and desserts. Pumpkin butter is made from pureed pumpkin, which is mixed with sugar, spices and water (or cider). Simply simmer the ingredients in a pan on the stove for around 30 minutes and then store in a jar to use on muffins or toast. Use the flesh to make muffin sized pumpkin tartlets; or a lovely sweet: cut up the flesh of a 5lb pumpkin and cook in a pan on the stove with some water and a little salt. Drain and mash the pumpkin and then place in a muslin and leave to hang overnight. The following day, mix together the pumpkin mash, the rind of one lemon, 14oz of sugar, 7oz of plain flour, 3 eggs, cinnamon (and some brandy for special holidays). Form the mixture into small balls and fry in hot oil until brown. Coat the pumpkin balls with a mixture of sugar and cinnamon and serve either hot or cold. Sweet pumpkin recipes are delicious enough to tempt the fussiest of eaters. For anyone who is not a large eater or finds eating difficult, they make a really great way of getting some much needed nutrition as they can be eaten just a little at a time and taste so good that they just call out to be finished. The bright orange color of pumpkin tells us that it is loaded with beta-carotene an important antioxidant which is converted to Vitamin A by the body and fulfills many important functions in the body. 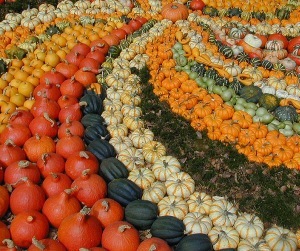 For anyone on a restricted diet, or who is particular about their nutrition, pumpkin is a valuable source for those trace minerals the body still needs to work properly; it reduces the risk of heart disease and certain cancers; it also offers protection against other diseases and some degenerative signs of aging. Pumpkin is not only packed with Vitamins A and E, but is also high in calcium, potassium and magnesium; and is low in calories. Not only is pumpkin great for soups, breads and sweets, it can also be used to replace other ingredients in recipes where a substitute is needed. Pumpkin puree can be used as a replacement for butter and oil in many recipes; not only does it take away those excessive calories and the fat, but it also adds mountains of goodness. Just replace the butter or oil with about 3/4 the amount of pumpkin puree to give that same moisture in your baking, or simply reduce the quantity of butter and make it up with pumpkin, to give the best of both worlds. For vegans, baking can be made easy by substituting a cup of pumpkin puree for each egg. Just remember that you will need to take into account whether the egg would be used for moisture, binding or leavening in the recipe as you may need to substitute or add other ingredients as well to obtain the right texture, especially in recipes where the egg helps the rising process.